(Nanowerk Spotlight) Dozens of nanotechnology research groups worldwide are working on the development of triboelectric nanogenerators (TENGs) for harvesting energy from mechanical vibrations (see: "Proposed standards for triboelectric nanogenerators could facilitate comparisons"). The huge interest in TENGs stems from their ability to convert ambient mechanical energy into electricity for powering wearable electronics, energy generation using sound, sensor networks, removing air pollution with nanogenerator-enhanced air filters, implantable medical devices, and other small systems (read more: "On route to self-powered smart suits"). 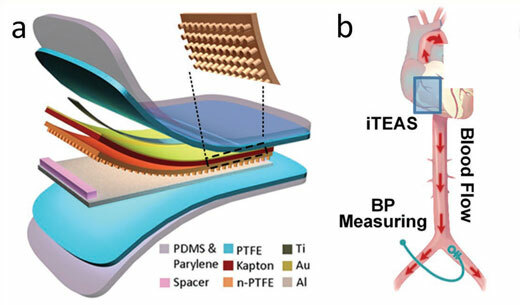 A recent article in Advanced Functional Materials ("Recent Advances in Triboelectric Nanogenerator-Based Health Monitoring") comprehensively reviews the recent advances in TENG-based health monitoring. As researchers have demonstrated in numerous applications, TENGs have been applied for health monitoring such as for instance heartbeat and breathing detection (read more: "Nanotechnology converts heartbeat and breathing into electricity"); respiration detection, or gait monitoring. 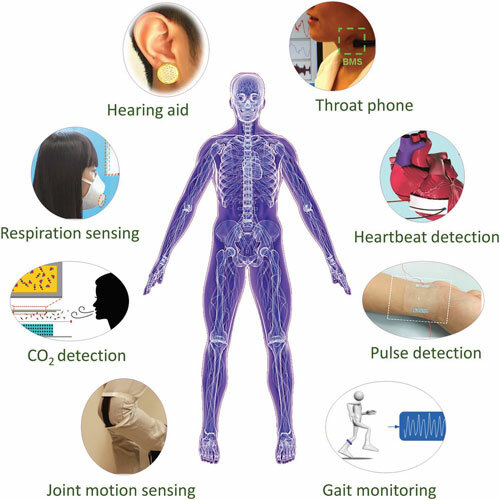 The review covers in-depth textile and non-textile TENGs as self-powered health monitors, respectively, and discusses types of health stimuli detected by the TENG-based self-powered health sensors. It also deals with the area of implantable TENG-based health monitors. In a final section, the authors discuss structure design, sensing mechanism, device performance, pros and cons of TENG-based health monitors and outline the existing challenges and future prospects for TENG-based health monitoring. 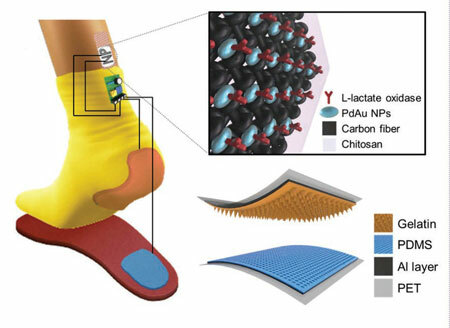 Textile-based TENGs possess merits such as good air permeability, flexibility and large-scale production, which makes them very suitable for wearable applications. Textile-based TENGs have been applied to serve as self-powered sensors for healthcare such as detection of respiration and sleep monitoring. Textile TENGs can be categorized into two types according to device structure. One type is that the TENG is a fabric woven by one or two kinds of triboelectric fibers. The other type is that the TENG uses two whole pieces of textile as the substrates or triboelectric layers. Textile TENGs can not only be worn on the body but also be integrated into furniture such as the bed to monitor human’s health status. Monitoring muscle/body motion such as joint motion, biceps exercises and abdominal respiration has wide applications in postoperative rehabilitation, sport and fitness management. The motion of the muscle or body has relatively large displacement, and thereby is relatively easy for TENGs to detect. In contrast, heartbeat and pulse have relatively small amplitudes, and that requires the sensors to possess high pressure sensitivity and low detection limit in order to obtain the information of heartbeats and pulses. TENGs have also been applied to monitor voice and act as hearing aids. Monitoring voice can not only pick up spoken sounds in noisy environments but could also be important in vocal rehabilitation. TENGs have also been applied as self-powered sensors to detect healthcare related chemicals such as carbon dioxide. The basic mechanism for this kind of TENG-based self-powered chemical sensors is that the chemical has an influence on the TENG’s performance, and a relationship between the electrical output and the chemical concentration can be obtained. Whereas the TENGs discussed above all act as self-powered health monitors themselves, TENGs can also be integrated into self-powered sensing systems with energy storage devices and health sensors to monitor health conditions such as heartbeat, pulse, body temperature, respiration, and lactate concentration. TENG-based self-powered health sensing system can not only detect motion-based stimuli but also detect stimuli that are not in the form of mechanical motion, which expands their health sensing applications. One issue with these devices is their currently unsatisfactory total energy conversion efficiency, which needs to be improved in order to ensure a continuous operation. Studies already have demonstrated several approaches that can enhance the TENG’s performance, which include using soft materials with nanostructured surface; surface modification of dielectric materials; and introducing built-in dielectric polarization. Implantable medical devices such as pacemakers, heart monitors, subdermal blood sensors, or drug pumps, have been undergoing continuous development in recent years. However, they still face big challenges such as minimizing the power consumption and extending the lifetime of the device. Nanogenerators are promising to address such challenges in ways of serving as self-powered sensors or acting as the power source of the implants. Heartbeats as well as the pulses in blood vessels are two common kinds of sources for implantable TENGs to generate electrical outputs. There are significant challenges, though. Apart from the usual risks of a surgical procedure, implantable TENGs are generally structured with a gas gap between two triboelectric layers, therefore careful and safe packaging is a mandatory requirement when implanting them into the body. "Overall" the authors conclude, "TENGs have shown great potential for applications of health monitoring, but there are still myriad challenges need to be addressed before industrialization and commercialization. Future work may include further expanding the health-related applications, optimizing the device structure, enhancing the sensitivity, improving the anti-interference ability, increasing the stability and improving the compatibility for integrated systems."